> Group 8 Created with Sketch. The swimming pool at Clifton Leisure Centre has re-opened. I woke up with a mass of butterflies in my stomach, this was it, today was the day! 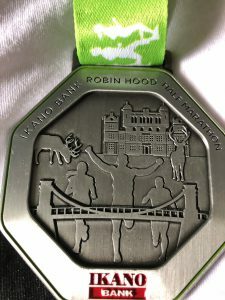 When my alarm sounded at 06:30 on the morning of the Ikano Bank Robin Hood Half Marathon I knew I’d done as much training as I could! I’d run 100 miles in training runs on the treadmill, in the gym at Djanogly Community Leisure Centre and also out on the road. I’d eaten well, kept myself hydrated and applied liberal amounts of Vaseline to places I won’t mention, so it was now game face time. Pinning my race number to my shirt really bought it home, I was ACTUALLY going to run in a half marathon! Lining up at the start in my section, I could see a river of people; all ages and different body shapes and sizes, some looking nervous, some focused and some just looking plain daft, including a Banana, Scooby Doo and a Viking longboat! And then we were off, tightly packed at first, but I was soon into my stride.The running went to plan for 10 miles and I was pacing exactly as I wanted and had trained for. Miles 11-12 were hard going though and my time slowed by a couple of minutes, however the last mile and a bit felt like I was running on Air, as the support was amazing! I even managed a sprint finish and completed the race in 2 hours 39 minutes 50 seconds, coming in just behind Scooby Doo. Running the Half marathon was a challenge and one I will definitely do again! 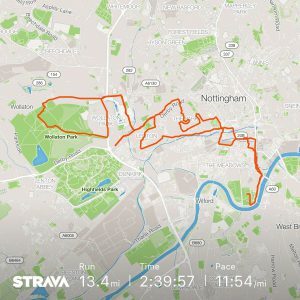 With the amazing support from the people of Nottingham, who lined the streets to cheer on the runners it’s a great way to improve my fitness and get the most out of my gym membership too. 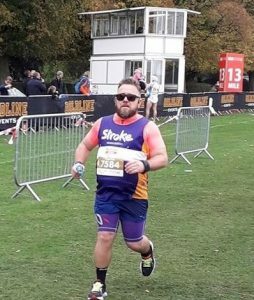 I raised over £400 pounds for the Stroke Association and now it’s time to recover with some gentle swimming and a few health suite sessions and plan my next Half or even FULL Marathon! If you’re thinking of running the Ikano Half Marathon in 2019 (and there’s currently an early bird booking offer! ), our Flexible Fitnessmembership will really help with your training. It’s gives you access to 8 gyms, 7 swimming pools, over 400 fitness classes and health suites and through our 1-2-1 sessions with a fitness advisor, we can help with your training plan too. Call 0115 876100 for more information or to sign up today! Save money on pay-as-you-go activities, book and pay online, skip the queues and more.